President Nicolás Maduro’s inauguration last Friday marked a new stage in the contest between chavistas and the Venezuelan opposition. Maduro’s surprisingly weak showing at the polls – winning by a meager 1.8 percent margin despite the huge (and abused) advantages of incumbency – plus tensions within his party and his own rhetorical excesses, suggest that chavismo without Chávez confronts challenging odds. Chávez attracted more votes alive than he could in death, as his hand-picked successor could not match his patron’s appeal at the ballot box. Looking forward, Maduro and the Partido Unido Socialista de Venezuela (PSUV) will be judged on the basis of their performance. The road ahead will not be easy for Maduro, as the government confronts growing economic and security problems, and his ineffective campaign may energize potential competitors from within Chavismo. Henrique Capriles’s strong showing in the election bodes well for the opposition. However, athough Maduro’s blanket reference to them as “fascists” is absurd, their apparent eagerness to use the vote recount – reluctantly agreed to by the electoral council hours before Maduro’s inauguration – to remove him from office could breathe life into his allegation that the opposition consists of golpistas obsessed with taking power. Overreaching could be their undoing, as it has been in the past. Latin American presidents, through a UNASUR statement of support and participation in the inauguration, have endorsed Maduro’s ascendance to the Presidency. 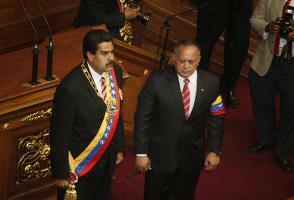 Their strong interest, for a variety of reasons, is in a balance between continuity and change in Venezuela. Although there are signs that both Chile and Colombia wavered momentarily, South American governments overall were united in their preference for a chavista government, as this would favor both internal and regional stability.The United States, on the other hand, has appeared timid. Maduro’s accusations of U.S. attacks on him and the presence of Iranian leader Ahmadinejad at the inauguration made it impossible for Washington to send a senior emissary to the swearing-in. Yet the evident absence of the United States, even after the UNASUR endorsement, was petty. Through statements calling for a recount of 100 percent of the votes both the State Department and the U.S. Ambassador to the United Nations came across as unable to outgrow a grudge match with Chávez or to grasp that the American position would isolate Washington once again from prevailing sentiment in South America. There were two winners in the Venezuelan election: Maduro, who is now the elected President, and Capriles, who managed to secure nearly half the votes in the face of overwhelming odds. The latter comes out ahead in the long run, but only if he manages his cards wisely. Washington, meanwhile, seems still not to understand two things: First, after Bush v. Gore, it will be at least another generation until Americans can say anything about how to count votes. It was legitimate and appropriate for the OAS to demand a recount, as its record in election monitoring is impeccable. Secretary General Insulza achieved the core objective of the Organization and should be recognized for having done so. For the American government to have taken the position that it did suggests an inability to understand the consequences of the 2000 election in Florida for its credibility in election-related issues in the region. Second, democratic change in Latin America is typically an evolutionary process. This may be less satisfying to some policymakers who would prefer to see a foe’s outright defeat, but it may be better, for Chavismo’s enemies in both Washington and Caracas, than having their favorite step in at this particular time of high tensions. If Capriles and his coalition can brand themselves as democratic reformists rather than golpistas, they have a good chance of coming to power when Maduro’s six-year term is exhausted, or even before, and if they convey a message of responsible opposition, key South American governments might well approve of an alternation in power the next time around. The first is that it is something of an exaggeration to say that the OAS has an impeccable record on elections. Sometimes yes (Peru) sometimes no, as with multiple cases in Venezuela including but not limited to the 2004 recall. In this they share a place (not a place of honor) with the Carter Center whose record in Venezuela was basically to wash its hands of things after an effort focused on mediation and getting sides to “understand one another” when they in fact understood one another very well. Having served on an OAS MOE (in Peru) I can attest to the fact that each mission reflects its chief and staff. The OAS also does the highest quality observation, with incredibly accurate quick counts and adequate personal to assess results. The key problem in Venezuela is that government did not want an OAS EOM. This places the OAS in an awkward position. They can’t accept any result, and it is impossible to make a proper assessment from afar. Demanding a full recount seems, under the circumstances, wise. I have to speak up for the Carter Center. They have done everything possible to be neutral and respected mediators which has won them the enmity of both sides. But to say they have washed their hands of things is unfair.